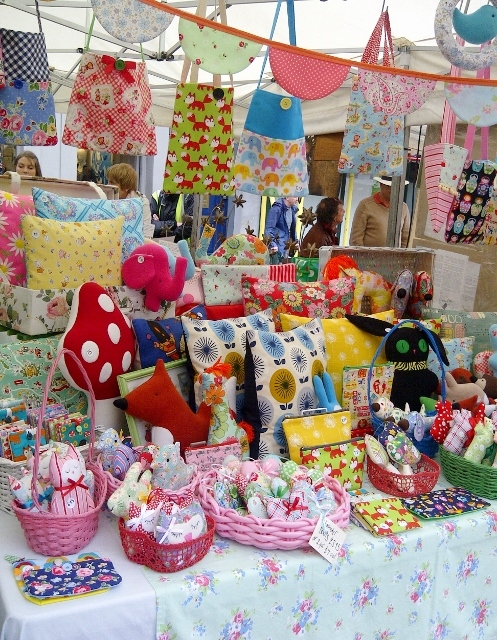 Don’t let the cold snap put you off our lovely fair tomorrow, in the main Square in Shrewsbury town centre…..9am-5pm. I have new things to show you, including little plush elephants now in the softest cuddly plush, in pastel shades just perfect for spring; opal mint, lavender and cucumber….They look adorable and feel just amazing. 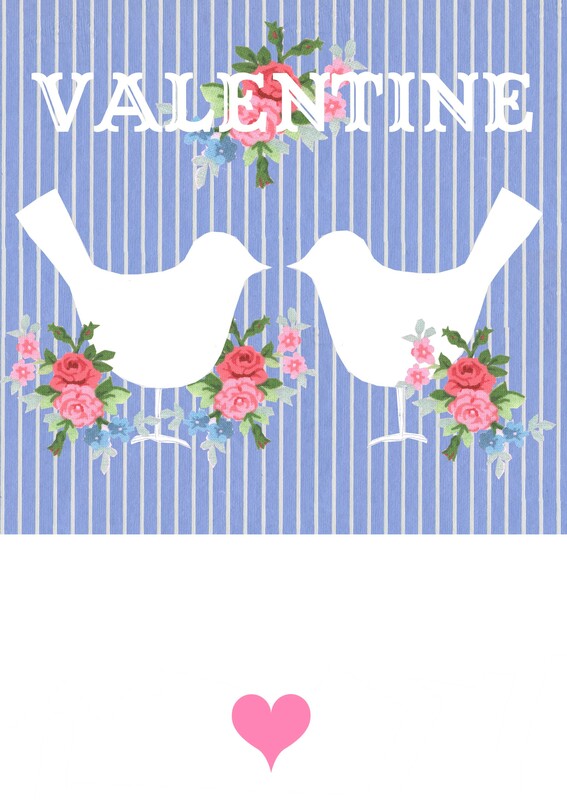 Some nods towards Valentine’s Day, including cards and hearts and ideas for Easter and Mother’s Day too. So if you’re about, then do come and see! 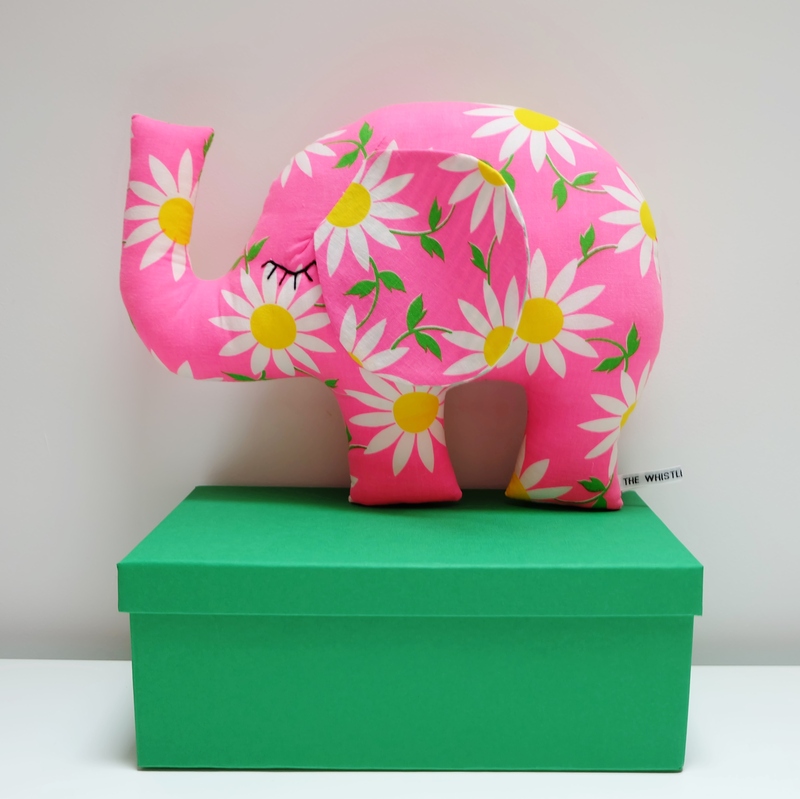 To get you in the romantic mood, here’s a vintage fabric elephant – in pink. Happy Valentine’s! This entry was posted in Events and tagged craft market shropshire, handmade fair, made in shropshire, pink elephant, shrewsbury events. shropshire craft, The Whistling Cowgirl, valentine fair, vintage style gifts. At last…I’m doing a market! Made in Shropshire, Saturday 13th June…. It’s been a long time since my last post. In fact, this is my first of the year. Sometimes life gets in the way. It’s been getting in my way, but now I’m back on track and getting down to it again. Another first of the year, for me, is this Saturday’s Made in Shropshire market in Shrewsbury town square. I have some lovely new goodies to share with you, so it would be fabulous to see you there! As per, it runs from 9am-5pm. It’s also Carnival day, so remember that the town centre is closed to traffic between 1.30 and 3.30pm, while the parade passes through. So come in early, or go home later! I’m going to post some pictures tomorrow, so come back and take a sneak peek! I’m looking forward to Saturday….I’ve missed my days in the square and hope to see you there! This entry was posted in Events, Handmade and tagged craft market shropshire, handmade fair, handmade shropshire, made in shropshire, shrewsbury events, shrewsbury markets, shropshire craft, shropshire days out, The Whistling Cowgirl. I LOVE these Liberty prints! I go in and out with Liberty fabrics – I’m having an ‘in’ time at the moment and can’t get enough of them. Strangely enough I saw the red and pink Liberty fabric in all its bright and British glory in a Parisian haberdashery shop this summer and have been coveting it ever since. I had to have some. 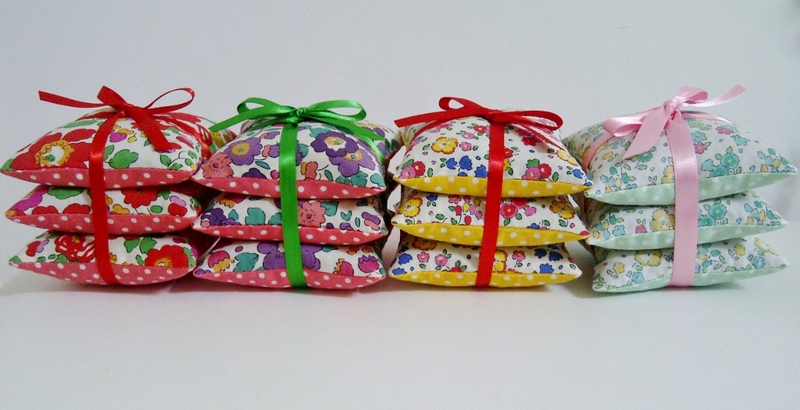 And I’ve acquired the same design in the purple colourway too – plus two new ditsy florals from the A/W 2014 range. 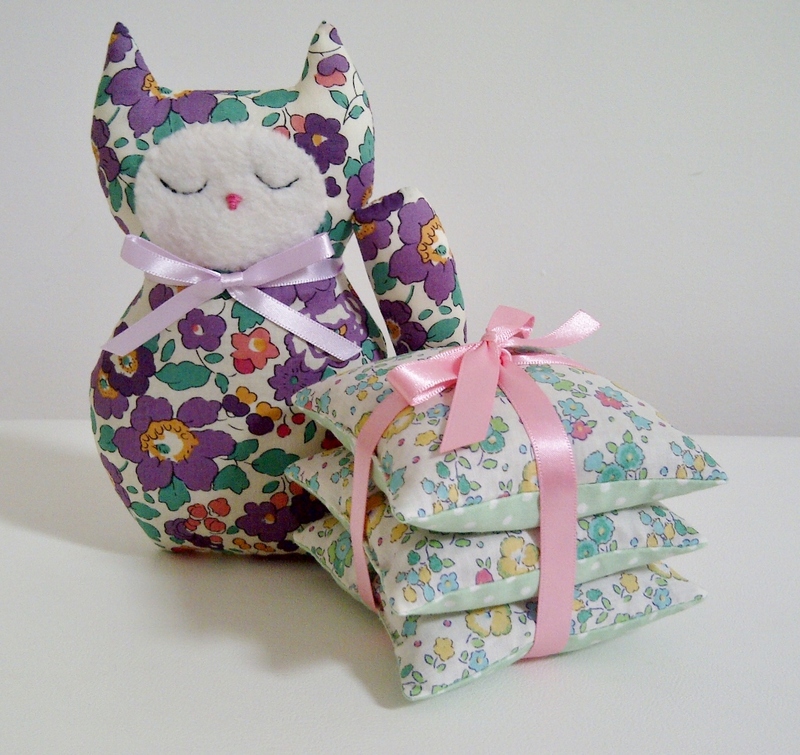 They are just adorably pretty and have so far made these sweet lavender pillow stacks and a lavender cat. I’m about to finish a cloud, a mini lavender bird and a couple of phone cases. All will be coming with me tomorrow to the Made in Shropshire ‘Fair in the Square’ – it’s Shrewsbury Flower Show weekend too, so that means it’s either going to be much busier….or much quieter……such are the vagaries of markets, especially during summer holiday time. You just never can tell! Do pop along to The Square anyway, if you’re about – we’re there from 9am-5pm! 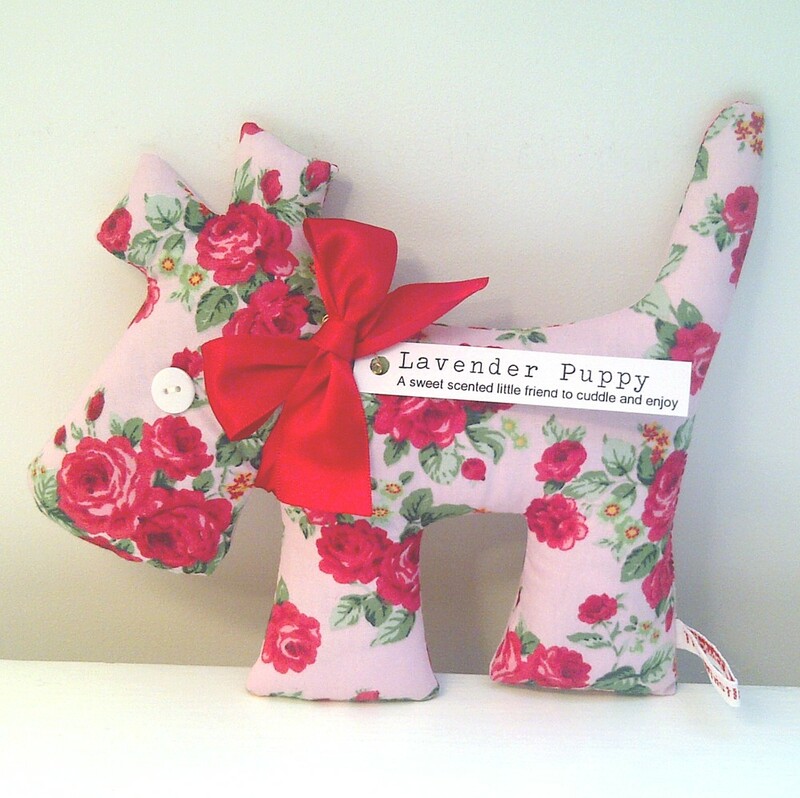 Then I’ll be adding some pieces into my Etsy and Folksy shops next week…. This entry was posted in Events, Handmade and tagged craft market shropshire, ditsy floral sachets, handmade fair, liberty fabric lavender sachets, liberty print fabrics, made in shropshire, shrewsbury flower show, shropshire craft fairs, shropshire events, The Whistling Cowgirl. Artisan Handmade and Vintage Brocante! I’m in the throes of last minute sewing for this exciting event, tomorrow, Saturday the 17th August. At least I will be once I’ve stopped tapping away at my keyboard here, and as long as I keep remembering it’s not the time to start trying to get through Claire de Lune on the piano. 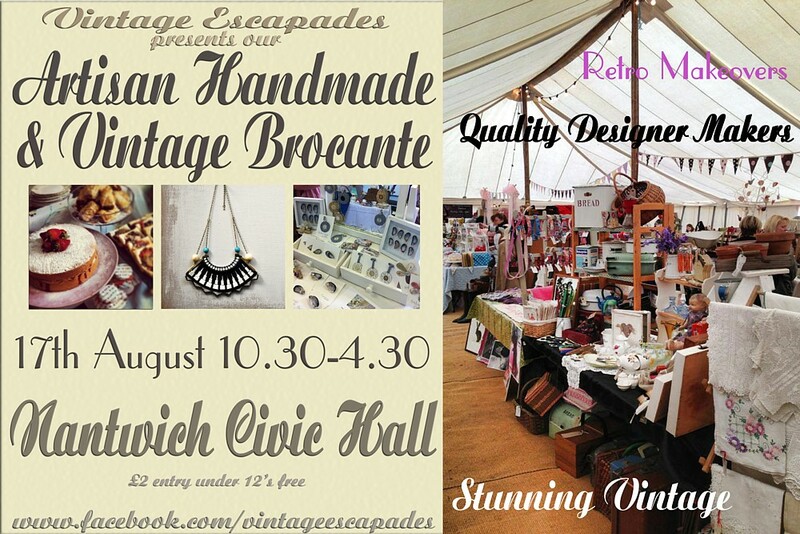 It’s the Artisan Handmade and Vintage Brocante at Nantwich Civic Hall, Cheshire. Lots and lots of fabulous sellers and the Pear of Peas tearoom…Pennie Pengilly’s cakes are the best in the land. From 10.30am-4.30pm. See www.facebook.com/vintageescapades for more details of who’s going to be there and what exciting things you can expect to see! This entry was posted in Events and tagged artisan handmade, august handmade, cheshire events, cheshire handmade, cheshire vintage, craft market, handmade fair, nantwich civic hall, nantwich events, the whistling cowgirl events, vintage brocante, vintage escapades, vintage handmade. I shall be in Ludlow town square this Saturday, the 1st of June, for Made in Shropshire’s monthly fair…Come and see some lovely locally made crafts and food, from 9am-5pm! 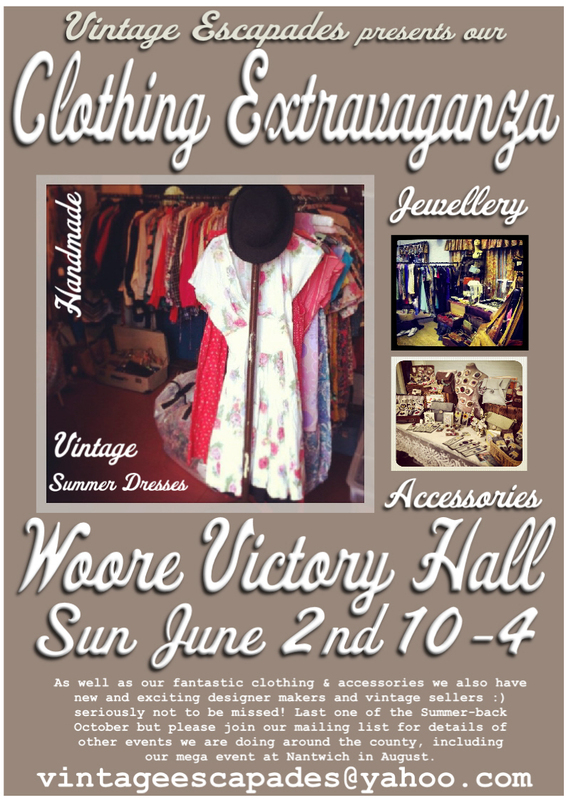 Then on Sunday it’s Vintage Escapades at Woore Victory Hall, 10am-4pm. It’s a clothing extravaganza! Come and pick up a new summer dress, so you’re ready when the sun comes out….surely sometime in June…. This entry was posted in Events and tagged cheshire craft fair, cheshire vintage fair, craft market, craft market shropshire, handmade and vintage, handmade and vintage cheshire, handmade fair, ludlow made in shropshire, ludlow market, made in shropshire, shropshire craft, the whistling cowgirl events, vintage escapades, vintage style gifts, woore victory hall. And also….it’s Vintage Escapades too! This Sunday, 7th April, it’s Vintage Escapades time at Woore Victory Hall, Woore, Cheshire! 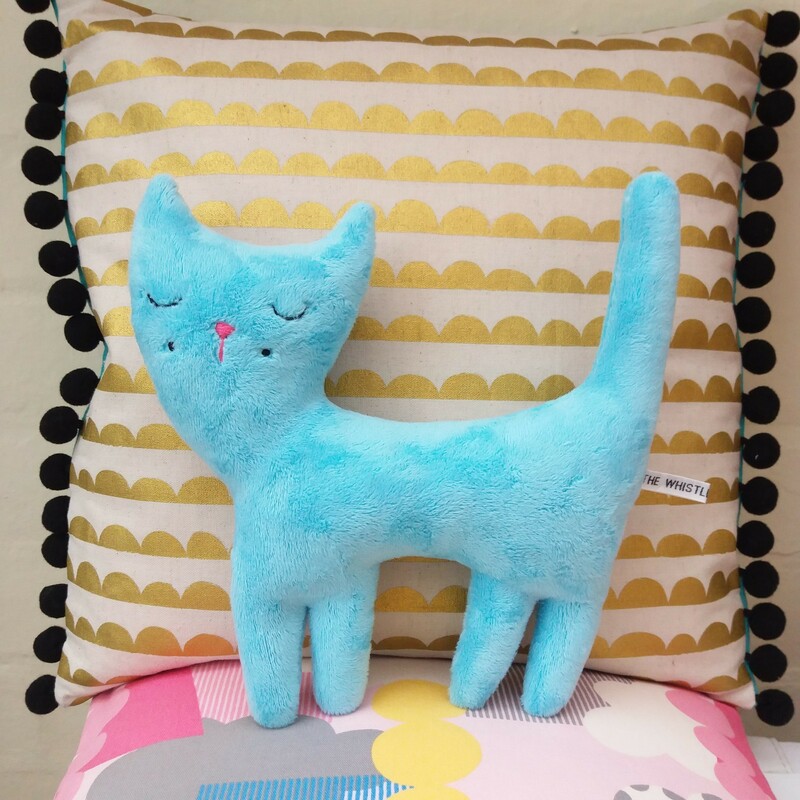 10am-4pm, with brilliant crafters and fabulous vintage…with a focus on clothing this month. I’ll treat myself to something, no doubt. See you there! This entry was posted in Events, Uncategorized and tagged cheshire craft fair, handmade and vintage, handmade fair, The Whistling Cowgirl, the whistling cowgirl events, vintage escapades spring fair, vintage events cheshire, vintage handmade, vintage style gifts, woore, woore victory hall. Pssst! Don’t forget! Vintage Escapades, Sunday 3 Feb! Just a quick reminder folks! Vintage Escapades starts again tomorrow! It’s the first fair of the year and Lexy has gathered together a spiffing line up of sellers and makers (why not check out Vintage Escapades on Facebook, to keep up with all the dates and goings on?). With Valentine’s Day edging closer, the theme, of course, is love…and I have more pink than usual for sale, and red too. It’s all hearts, birdies and flowers. Sigh. 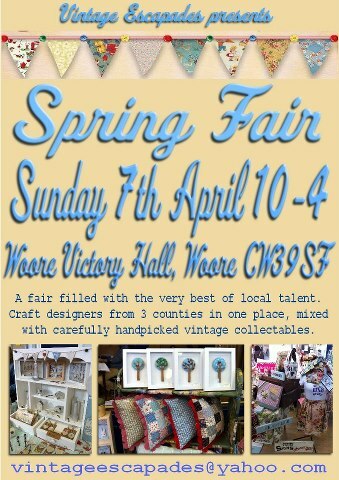 10am-4pm, Woore Victory Hall, Woore, Cheshire. This entry was posted in Events, Handmade and tagged cheshire fair, handmade fair, retro fabrics, retro toys, shop handmade, the whistling cowgirl events, valentine's gifts, valentines day handmade gift, vintage and handmade, vintage escapades, vintage fabric toys, woore victory hall. Bus Stop Vintage…Come and See Us Tomorrow! It’s the first Bus Stop Vintage Fair tomorrow, and I’ll be there, so please come and have a peep! It’s in St Mary’s Church, right in the heart of Shrewsbury town centre, opposite Vinegar Hill. Running from 10am-4pm, there’ll be wonderful vintage sellers and handmade goodies for your delectation. And the tearoom, of course, with hot coffee and tea and cakes galore. Hope to see you there! I have some brand new, fresh off the bolt creations, plus some sale items to tempt you! This entry was posted in Events, Uncategorized and tagged 25th january handmade and vintage, bus stop vintage, craft fair shrewsbury, handmade fair, shrewsbury vintage fair, shropshire events 25th january, shropshire vintage fair, The Whistling Cowgirl.